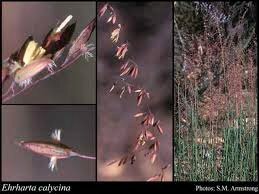 This grass was encouraged to emigrate from South Africa for use as a fodder crop. Unfortunately, it likes our shores so much that it is now invading local ecosystems, presenting a major threat to our local native plants. It’s a hardy blighter: it likes the poor, sandy soils around Cape Jervis, is resistant to drought, and its seed will germinate in most conditions. The massive amounts of seed each plant produces germinate quickly compared to native species, so it doesn’t give the natives much of a fighting chance! You can fight back against this bad guy by using herbicide in winter, or by manually removing plants in summer. This entry was posted in Weeds by cjccg01. Bookmark the permalink.